City officials unveiled their plan for new landscaping in the East Bank District Tuesday. Chief Administrative Officer Pam Glorioso told the Bossier City Council at their regular meeting that a committee has selected the plants to replace previous greenery in the district. Specifically, the East Bank District landscaping committee — consisting of Glorioso, city councilmen, and an LSU AgCenter official — selected yellow iris plants and Texas Mountain Laurel trees to go in the planters in the new downtown area. “Specifically, this is the area in downtown missing plants in the bioswells (planters). It is approximately eight areas throughout East Bank,” Glorioso clarified. Glorioso has requested a bid for 4,000 irises and 52 trees that she plants to present to the council at their next meeting on May 8. “I will come back before you all with the price chosen by the committee, and that money will come from the downtown redevelopment fund,” Glorioso said. Glorioso also has issued a RFP (request for proposal) for maintenance of the landscaping in the district. She expects to present those bids at the May 22 meeting. The need for the new plants came after the original plants were removed by the city in November, prior to the development’s grand opening. “We had one plant we thought we’d like in that area. There seemed to be some not wanting that particular species down there,” Glorioso told the Press-Tribune in April. The search for an event planner for East Bank is also ongoing. She told the council Tuesday that she expects the return of RFPs for that also on May 22. In late February, the city council defeated a proposed ordinance to allow the city to enter into an agreement with Gumbeaux Event Productions to manage festivals and events in the East Bank District and Festival Plaza. Council members expressed concern in that meeting that other event management companies had not been invited to bid on the contract. Glorioso told the Press-Tribune last month that the city was reviewing what they wanted out of the events planner. “We plan as a city administration and coordinated with the city council to see what they wanted to see in this request for a management and planning organization to come into the East Bank District,” she said. East Bank District has had to overcome several issues since its grand opening. Late last year, the city council voted down an open container ordinance that encompassed the district as well as casinos and Louisiana Boardwalk Outlets. It was revised to only include the festival area in the district, but then came under threat after it violated a Bureau of Alcohol and Tobacco Control regulation. That issue was eventually solved with help from State Sen. Barrow Peacock (R-Bossier City). 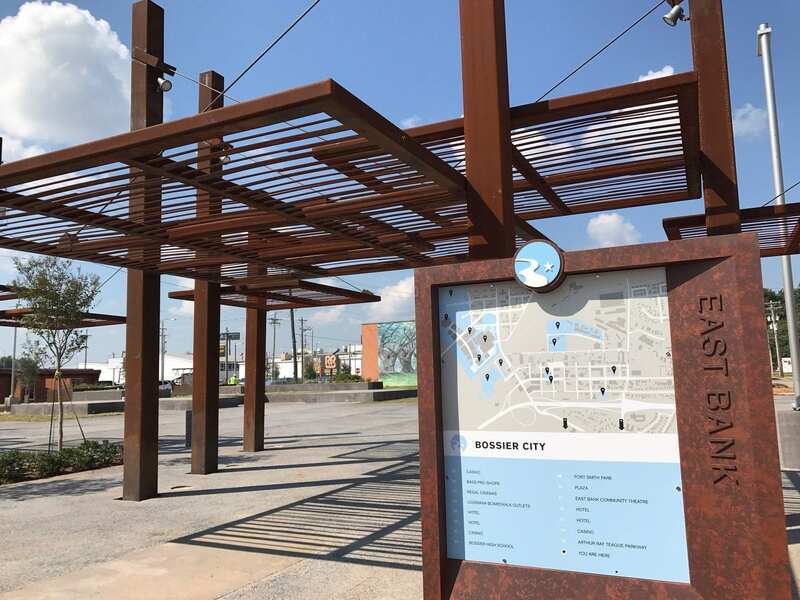 The city has spent $15 million renovating one mile of Barksdale Boulevard to create the district and encourage new development. The city installed new infrastructure, changed the road to two lanes instead of four, and installed sidewalks, bike paths, and landscaping. The city also added new design elements and the festival space to host events.